heather & olive: the stew: a review. Have you made THE STEW yet? Alison Roman's chickpea recipe has been everywhere since published in the NY Times at the end of November, and it took me until now to make it. What is it? 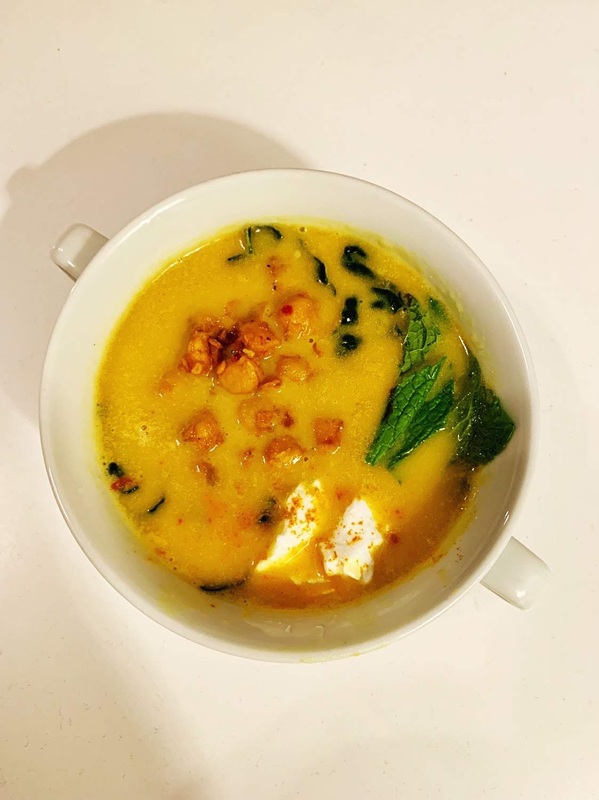 A bunch of chickpeas are sautéed with ginger, garlic, onions and turmeric and then get smashed and simmered with coconut milk and vegetable broth. Add some kale (or any other leafy green you have on hand) and simmer a bit more, and the final product is garnished with yogurt (omit if vegan), mint, and some previously reserved crispy-ish chickpeas. HOW is it? Honestly, it blew me away. I'm the kind of girl who could never go vegan due to my love of all things dairy, and this would have been just as amazing without the dollop of yogurt. The flavors that come to together are super complex and comforting, and the coconut milk really takes everything to the next level. Suggestions? I followed the recipe to a T and I wouldn't change anything--it calls for a teaspoon of red pepper flakes and I'm a total weenie when it comes to spice but it was perfect (noticeable but not overpowering). If you're sensitive to spice I would reduce to 1/2 a teaspoon. Also, I probably could have cooked the chickpeas during their initial sauté for a bit longer--that helps it become thicker, and I ultimately cooked it longer than the recipe required to get the thicker consistency. It definitely thickened up after being refrigerated for leftover day two. Final takeaway? Pure deliciousness--like nothing in my usual recipe repertoire but I will 100% be making again. I haven't made this yet, either. But it is on my list.